built with 105 recycled shipping pallets, this innovative structure by b sq. Design Studio Inc. included walkways, a playhouse, a water feature, and vertical herb gardens that delighted visitors at the flower and garden festival. Ecohome March 30, 2012, 3:54 p.m.
b sq. Design Studio Inc. is a Toronto based landscape design and build firm that endeavours to create elegant and modern landscapes with a focus on sustainability and longevity for their work. “Plug and Play – the Pallet Garden” is their 5th feature garden installation for the annual Canada Blooms Garden Festival. With interior and exterior climbable walls, plenty of counter space, a 12 foot roof deck and two door openings, this structure is the ultimate play space for children and adults alike. Recycled wood pallets were chosen as the primary material for this feature garden as they were a commonly available material that everyone would recognize but be surprised to see employed in such an aesthetically pleasing, fun and practical way. Challenging themselves to take this common element and make it into something beautiful and interesting, the b sq. Design Studio succeeded with overwhelmingly positive response from visitors and exhibitors both. 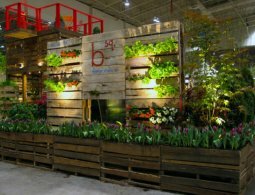 The use of shipping pallets as a garden element is a natural progression for b sq. Design Studio. They made their mobile design office from a standard 8’ x 20’ Shipping container as their display for a number of shows in 2009. Since then the b sq. 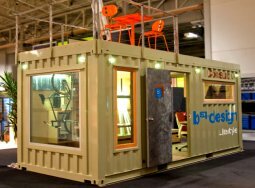 Design Studio has extended the life of their trade show container display indefinitely by using it as their mobile support office. 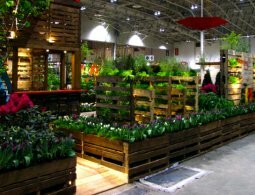 At the completion of the show the "Plug and Play - the Pallet Garden" display will be dismantled, the pallets will be returned to the warehouses and the plant materials will be relocated into permanent locations throughout Toronto. Hi EcoHome, Thank you for adding us to your blog and sharing our concept at this past Canada Blooms Show. We hope to inspire many and get the audience thinking one step further. Thanks again and we do apprecaite the exposure. We like to feature building projects that use recycled materials, it shows others what is possible. I love this idea. I want one in Maine!! Looks awesome. The room is very warm and inviting. On my site http://veganslivingofftheland.blogspot.com I have posted ways for apartment dwellers to grow food through vertical and container gardening. Go to the search bar of the site and type in "Three Ways to Grow Food & Other Plants for Apartment Dwellers (Indoors/Outdoors)". A concern for the pallet garden is the past use of the pallets. How do you know the past uses and have they absorbed toxic substances in the course of their life span.